In London, Wedding Waiting Enters Its Final Hours After five months of planning and anticipation, it's showtime. 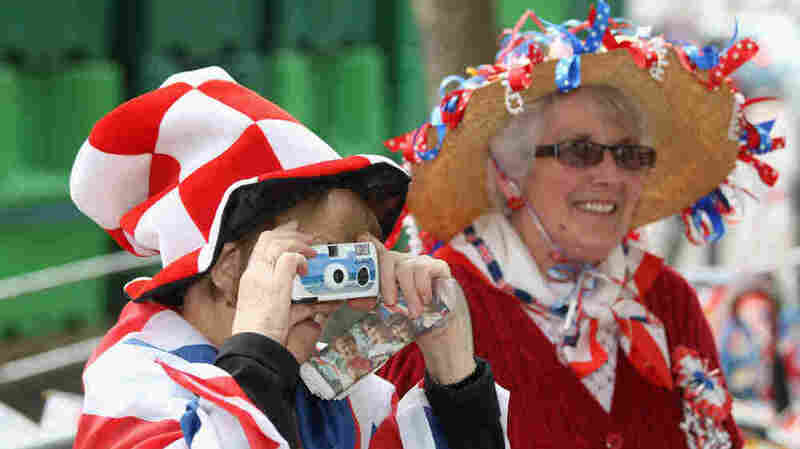 Swarms of people have descended on London for the nuptials of Prince William and Kate Middleton. And while the bride and groom may be trying to take a low-key approach to the whole thing, London is anything but low key. 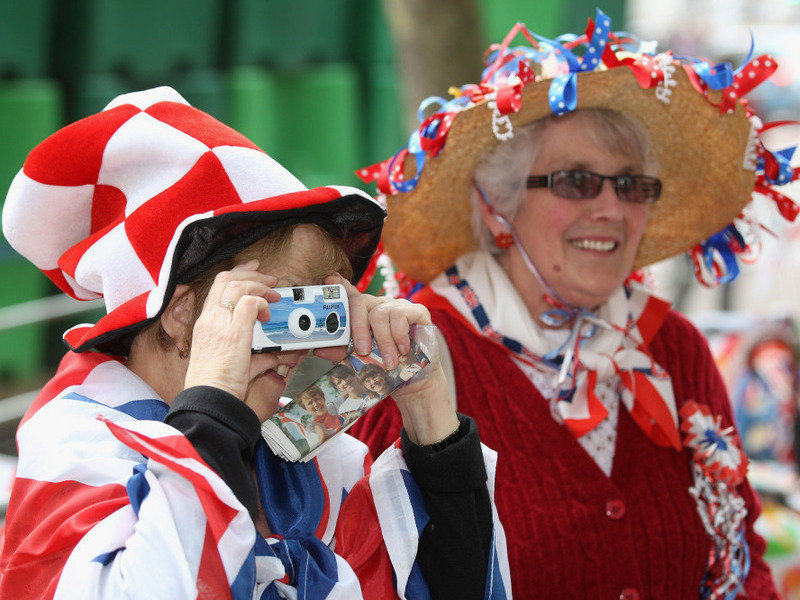 Fans of the royal family take photographs as they wait for the wedding of Prince William and Kate Middleton in London. After five months of planning and anticipation, it's showtime in London. The wedding ceremony of Prince William and Kate Middleton Friday morning at Westminster Abbey has a guest list of around 2,000 people — including friends of the bride and groom, members of the royal family and members of other countries' royal families. After the vows, the bride and groom will ride to Buckingham Palace in the same gold carriage the late Princess Diana used 30 years ago. Swarms of people have descended on London for the nuptials. The British papers are obsessed with gossipy details on an average day. The day before a royal wedding? They've gone a bit mad. -- Prince William "played five-a-side football in Battersea Park, south London, wearing a thrown-together kit of mismatched socks, shorts and T-shirt." -- Middleton, meanwhile, was spotted unloading a cardboard box from her car. "Photographers saw a sheaf of papers on the back seat, which included the passage, 'With so much love within our hearts,' leading to speculation it may be part of the service." -- And, overall, the couple "adopted a distinctly low-key approach to their preparations." But while the bride and the groom may be trying to take a low-key approach to the whole thing, London is anything but low key. In the shadow of Big Ben, people are streaming by Westminster Abbey, trying to get a close-up look before the surrounding streets close Thursday night — and before the crowds get too thick to see much of anything. Harry and Jeanne Lord of New Jersey traveled to London for the wedding. Their kids think they're "insane" for coming, they say. 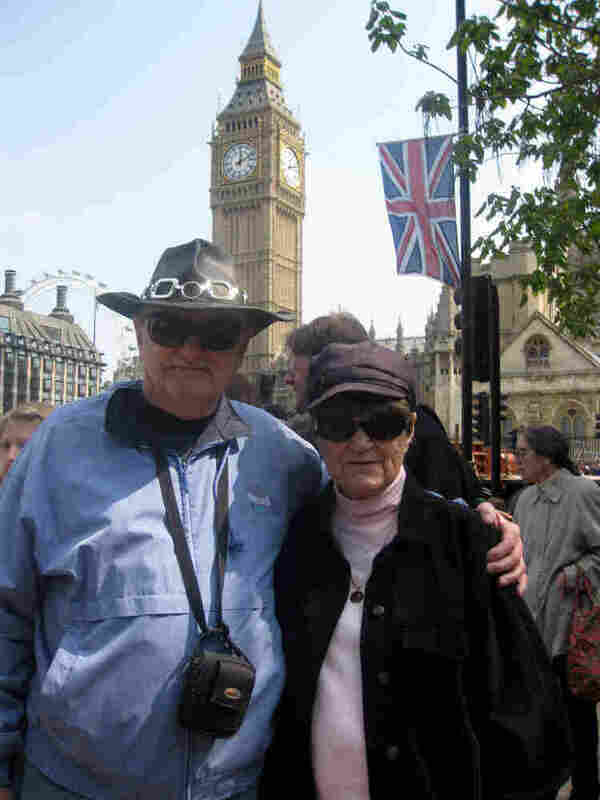 Jeanne Lord has talked her husband, Harry, into a trip to London from their home in New Jersey. "It's history," she says. "I think that's what a lot of the fascination is all over the world — history, seeing a future king and queen and the present queen. We'll never be able to do it again in our lifetime." Harry Lord was decked out in a leather cowboy hat and a Harrah's Casino windbreaker. Rain is forecast for Friday, but the Lords are not worried — even though they're not exactly on the official guest list. "We have an invitation to stand on the street like the rest of the commoners," Jeanne says, laughing. "Even though our family name is Lord, we're not lords," Harry adds. "Maybe ... I could have gone as Lord Harry, instead of Harry Lord." People like the Lords, who have traveled miles for a wedding they won't even see, have a lot of explaining to do at home. The Lords said their kids were mystified. "They think we're utterly insane," Jeanne says. And their answer? "We are," she says. Her husband echoes that sentiment. "I spent more on this wedding than I did my own," Harry says. "We've been married 55 years, so weddings were cheaper then, but ..."
How much did they spend on their own wedding? "About $400," he says. "Max," his wife adds. 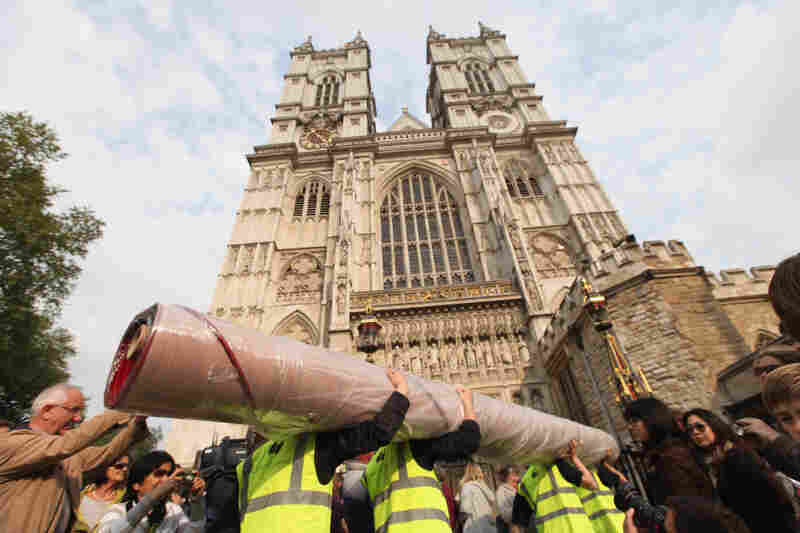 Workers carry in sections of the red carpet at Westminster Abbey, where Prince William and Kate Middleton are scheduled to get married Friday. Friday's wedding is sure to cost in the millions of dollars. British citizens, for their part, seem less than excited. One poll last week found 70 percent put themselves in one of two categories: "indifferent" about the wedding or "couldn't care less." But Maureen Gearing is excited. All the nostalgia from the royal wedding of 1981 is coming back. "I came up when Charles and Diana got married, and I wanted the atmosphere. So I've come up to see the son, see. Get the atmosphere again!" she says. "Get the train home," Gearing says. They're not planning to stay for the big show. "My poor old bones wouldn't take laying on the pavements anymore," Gearing says. "Don't forget it was 30 years ago when they got married. I was a lot younger." The women said they would be in a living room on Friday, watching every development on the telly. "Few coffees, lots to eat, lots to drink," Gearing says.